Cleaner, more transparent and brighter in chroma than Cadmium Yellow Light, this is a high-tinting, semi-transparent organic pigment. 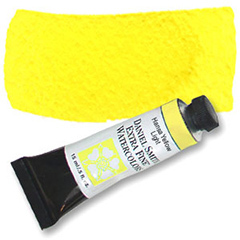 Hansa Yellow Light is considered the 'perfect yellow', offering more control when mixing. Painters admire the purity of this primary pigment and ability to adjust its temperature while avoiding a gray from a hidden complement. Think of a yellow pepper.